It might not come as too much of a surprise to learn that CBS have big plans for this year, what with it being the 50th anniversary of Star Trek n'all. Details of several of the latest events planned for this year have been revealed in the last few days; there should be lots to keep us entertained and help us celebrate this golden year. The highlight of the planned events in my mind, is the 50 Artists. 50 Years. 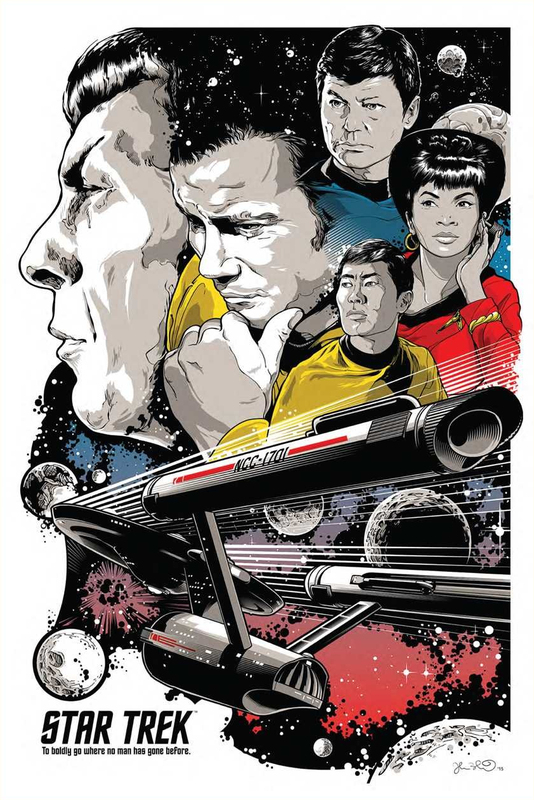 project which USA Today have now revealed will be a worldwide travelling exhibition of Star Trek inspired art, in many forms, including illustration, photography, and graphic design. This exhibit will first open at the San Diego Comic Con in July, before moving on to other venues. We've already had our first glimpse at this thanks to early previews for a calendar using some of the artwork - I find it hard to imagine we won't see what will surely be a rich source of Star Trek imagery turn up in other places and products down the line too. USA Today have confirmed the exhibit will include work by Leonard Nimoy, and the credits for the calendar suggest other contributors will include Tom Whalen, Nick Walker, Johnson Tsang, Derek Charm, and Susan Beatrice. Think TED Talks inspired by tricorders, alien species and the Prime Directive. Starting in July, schools, science museums and entertainment venues around the world will feature experts leading discussions on topics examined in Star Trek, including space exploration, medical technology and cultural diversity. Sounds excellent! Star Trek's cultural impact, and messages on all sorts issues of science and ethics is hard to underestimate, I'm delighted CBS are making an effort to celebrate this as well as the ore obvious iconography and celebrity. Hopefully like actual TED Talks these will be made available online too! 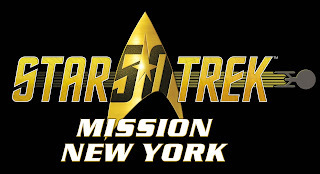 ...there will be interactive activities and unique technology, including Leap Motion, voice recognition to communicate with a Klingon, a Medical Tricorder table with RFID sensors, planet projection mapping, holograms and a shooting game using Star Trek’s iconic phasers. Visitors also will have a chance to learn about the real-life inventions inspired by Star Trek as well as the science behind them. The whole thing is set-up in a (for some reason) 26th century version of Starfleet Academy, where "cadets" are guided through nine different zones, based on different Starfleet specialisms, such as language, medicine, engineering, navigation, command and science. The Experience will first open in May, in Canada at the Aviation and Space Museum in Ottawa, and then in June at the Intrepid Sea, Air and Space Museum in New York in the US. There is no shortage of conventions this year. There is of course the regular official Star Trek convention in Las Vegas, organised by Creation Entertainment, which this year will be held from the 3rd to the 7th of August. 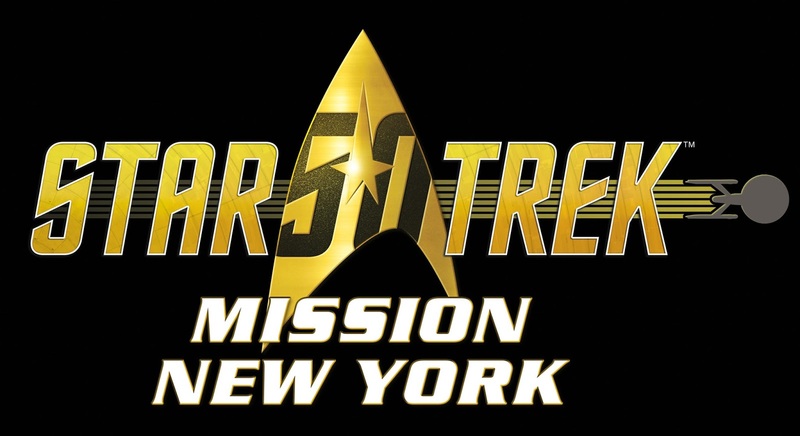 But if you're on the other side of the US then you'll have another option this year, as CBS and ReedPop will also be running Star Trek: Mission New York from September the 2nd to the 4th. And then if you're in Europe, you'll be wanting to head to London, for the latest Destination Star Trek convention from the 7th to the 9th of October! Naturally you can expect all sorts of Star Trek guests, panels, exhibitions, and general stuff, at all of these, although there haven't been many announcements of exactly what or who will be at each of them so far. Looking to 2017, there is also a floating convention! Star Trek: The Cruise, which sets sail in January 2017 with a host of Star Trek actors on board with other two-thousand trekkie passengers. Alas that ship has sort of already sailed, as the cruise has sold out already!